In 1958, scientists at the Lawrence Berkeley National Laboratory claimed the discovery of element 102, now called nobelium. At the same time, they also attempted to synthesize element 103 by bombarding the same curium target used with nitrogen-14 ions. A follow-up on this experiment was not performed, as the target was destroyed. Eighteen tracks were noted, with decay energy around 7000900000000000000♠9±1 MeV and half-life around ​1⁄4 s; the Berkeley team noted that while the cause could be the production of an isotope of element 103, other possibilities could not be ruled out. While the data agrees reasonably with that later discovered for 257Lr (alpha decay energy 8.87 MeV, half-life 0.6 s), the evidence obtained in this experiment fell far short of the strength required to conclusively demonstrate the synthesis of element 103. Later, in 1960, the Lawrence Berkeley Laboratory attempted to synthesize the element by bombarding 252Cf with 10B and 11B. The results of this experiment were not conclusive. 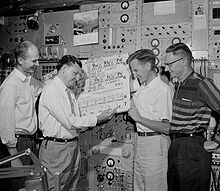 The first important work on element 103 was carried out at Berkeley by the nuclear-physics team of Albert Ghiorso, Torbjørn Sikkeland, Almon Larsh, Robert M. Latimer, and their co-workers on February 14, 1961. The first atoms of lawrencium were reportedly produced by bombarding a three-milligram target consisting of three isotopes of the element californium with boron-10 and boron-11 nuclei from the Heavy Ion Linear Accelerator (HILAC). The Berkeley team reported that the isotope 257103 was detected in this manner, and that it decayed by emitting an 8.6 MeV alpha particle with a half-life of 7000800000000000000♠8±2 s. This identification was later corrected to be 258103, as later work proved that 257Lr did not have the properties detected, but 258Lr did. This was considered at the time to be convincing proof of the synthesis of element 103: while the mass assignment was less certain and proved to be mistaken, it did not affect the arguments in favor of element 103 having been synthesized. Scientists at the Joint Institute for Nuclear Research in Dubna (then in the Soviet Union) raised several criticisms: all but one were answered adequately. The exception was that 252Cf was the most common isotope in the target, and in the reactions with 10B, 258Lr could only have been produced by emitting four neutrons, and emitting three neutrons was expected to be much less likely than emitting four or five. This would lead to a narrow yield curve, not the broad one reported by the Berkeley team. A possible explanation was that there was a low number of events attributed to element 103. This was an important intermediate step to the unquestioned discovery of element 103, although the evidence was not completely convincing. 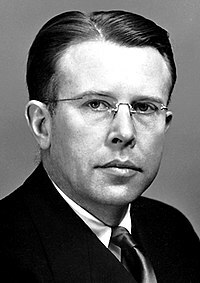 The Berkeley team proposed the name "lawrencium" with symbol "Lw", after Ernest Orlando Lawrence, inventor of the cyclotron. The IUPAC Commission on Nomenclature of Inorganic Chemistry accepted the name, but changed the symbol to "Lr". This acceptance of the discovery was later characterized as being hasty by the Dubna team. Further experiments in 1969 at Dubna and in 1970 at Berkeley demonstrated an actinide chemistry for the new element, so that by 1970 it was known that element 103 is the last actinide. In 1970, the Dubna group reported the synthesis of 255103 with half-life 20 s and alpha decay energy 8.38 MeV. However, it was not until 1971, when the nuclear physics team at the University of California at Berkeley successfully performed a whole series of experiments aimed at measuring the nuclear decay properties of the lawrencium isotopes with mass numbers from 255 through 260, that all previous results from Berkeley and Dubna were confirmed, apart from the Berkeley's group initial erroneous assignment of their first produced isotope to 257103 instead of the probably correct 258103. All final doubts were finally dispelled in 1976 and 1977 when the energies of X-rays emitted from 258103 were measured. Lawrencium is the final member of the actinide series and is sometimes considered to be a group 3 element, along with scandium, yttrium, and lutetium, as its filled f-shell is expected to make it resemble the 7th-period transition metals. In the periodic table, it is located to the right of the actinide nobelium, to the left of the 6d transition metal rutherfordium, and under the lanthanide lutetium with which it shares many physical and chemical properties. Lawrencium is expected to be a solid under normal conditions and assume a hexagonal close-packed crystal structure (c/a = 1.58), similar to its lighter congener lutetium, though this is not yet known experimentally. The enthalpy of sublimation of lawrencium is estimated to be 352 kJ/mol, close to the value of lutetium and strongly suggesting that metallic lawrencium is trivalent with the 7s and 6d electrons delocalized, a prediction also supported by a systematic extrapolation of the values of heat of vaporization, bulk modulus, and atomic volume of neighboring elements to lawrencium. Specifically, lawrencium is expected to be a trivalent, silvery metal, easily oxidized by air, steam, and acids, and having an atomic volume similar to that of lutetium and a trivalent metallic radius of 171 pm. It is expected to be a rather heavy metal with a density of around 15.6 to 16.6 g/cm3. It is also predicted to have a melting point of around 1900 K (1627 °C), not far from the value for lutetium (1925 K). 1969 studies on the element showed that lawrencium reacted with chlorine to form a product that was most likely the trichloride LrCl3. Its volatility was found to be similar to that of the chlorides of curium, fermium, and nobelium and much less than that of rutherfordium chloride. In 1970, chemical studies were performed on 1500 atoms of the isotope 256Lr, comparing it with divalent (No, Ba, Ra), trivalent (Fm, Cf, Cm, Am, Ac), and tetravalent (Th, Pu) elements. It was found that lawrencium coextracted with the trivalent ions, but the short half-life of the 256Lr isotope precluded a confirmation that it eluted ahead of Md3+ in the elution sequence. Lawrencium occurs as the trivalent Lr3+ ion in aqueous solution and hence its compounds should be similar to those of the other trivalent actinides: for example, lawrencium(III) fluoride (LrF3) and hydroxide (Lr(OH)3) should both be insoluble in water. Due to the actinide contraction, the ionic radius of Lr3+ should be smaller than that of Md3+, and it should elute ahead of Md3+ when ammonium α-hydroxyisobutyrate (ammonium α-HIB) is used as an eluant. Later 1987 experiments on the longer-lived isotope 260Lr confirmed lawrencium's trivalency and that it eluted in roughly the same place as erbium, and found that lawrencium's ionic radius was 7001886000000000000♠88.6±0.3 pm, larger than would be expected from simple extrapolation from periodic trends. Later 1988 experiments with more lawrencium atoms refined this value to 6989881000000000000♠88.1±0.1 pm and calculated an enthalpy of hydration value of 2993631500000000000♠−3685±13 kJ/mol. It was also pointed out that the actinide contraction at the end of the actinide series was larger than the analogous lanthanide contraction, with the exception of the last actinide, lawrencium: the cause was speculated to be relativistic effects. It has been speculated that the 7s electrons are relativistically stabilized, so that in reducing conditions, only the 7p1/2 or 6d electron would be ionized, leading to the monovalent Lr+ ion. However, all experiments to reduce Lr3+ to Lr2+ or Lr+ in aqueous solution were unsuccessful, similarly to lutetium. On the basis of this, the standard electrode potential of the E°(Lr3+→Lr+) couple was calculated to be less than −1.56 V, indicating that the existence of Lr+ ions in aqueous solution was unlikely. The upper limit for the E°(Lr3+→Lr2+) couple was predicted to be −0.44 V: the values for E°(Lr3+→Lr) and E°(Lr4+→Lr3+) are predicted to be −2.06 V and +7.9 V. The stability of the group oxidation state in the 6d transition series decreases as RfIV > DbV > SgVI, and lawrencium continues the trend with LrIII being more stable than RfIV. In the molecule lawrencium dihydride (LrH2), which is predicted to be bent, the 6d orbital of lawrencium is not expected to play a role in the bonding, unlike that of lanthanum dihydride (LaH2). LaH2 has La–H bond distances of 2.158 Å, while LrH2 should have shorter Lr–H bond distances of 2.042 Å due to the relativistic contraction and stabilization of the 7s and 7p orbitals involved in the bonding, in contrast to the core-like 5f subshell and the mostly uninvolved 6d subshell. In general, molecular LrH2 and LrH are expected to resemble the corresponding thallium species (thallium having a 6s26p1 valence configuration in the gas phase, like lawrencium's 7s27p1) more than the corresponding lanthanide species. The electron configurations of Lr+ and Lr2+ are expected to be 7s2 and 7s1 respectively, unlike the lanthanides which tend to be 5d1 as Ln2+. However, in species where all three valence electrons of lawrencium are ionized to give at least formally the Lr3+ cation, lawrencium is expected to behave like a typical actinide and the heavier congener of lutetium, especially because the first three ionization potentials of lawrencium are predicted to be similar to those of lutetium. Hence, unlike thallium but like lutetium, lawrencium would prefer to form LrH3 than LrH, and LrCO is expected to be similar to the also unknown LuCO, both metals having a valence configuration of σ2π1 in their respective monocarbonyls. The pπ–dπ bond is expected to be observed in LrCl3 just as it is for LuCl3 and more generally all the LnCl3, and the complex anion [Lr(C5H4SiMe3)3]− is expected to be stable just like its lanthanide congeners, with a configuration of 6d1 for lawrencium; this 6d orbital would be its highest occupied molecular orbital. −0.07 eV, agreed very well with the relativistic theoretical prediction of 4.963(15) eV, and also provided a first step into measuring the first ionization energies of the transactinides. This value is the lowest among all the lanthanides and actinides, and supports the s2p configuration as the 7p1/2 electron is expected to be only weakly bound. This suggests that lutetium and lawrencium behave similarly to the d-block elements (and hence being the true heavier congeners of scandium and yttrium, instead of lanthanum and actinium), and also that lawrencium may behave similarly to the alkali metals sodium and potassium in some ways. Given that the s2p configuration is correct, then lawrencium cannot be regarded as a transition metal under the IUPAC definition ("An element whose atom has an incomplete d sub-shell, or which can give rise to cations with an incomplete d sub-shell"), unlike its lighter homolog lutetium and the group 3 elements, with which lutetium and lawrencium are sometimes classified. It is nevertheless quite likely that metallic lawrencium will behave similarly to curium, which has an [Rn]5f76d17s2 configuration, and show the expected [Rn]5f146d17s2 configuration, which is supported by the earlier volatility experiments. Twelve isotopes of lawrencium are known, with mass numbers 252–262 and 266; all are radioactive. Additionally, one nuclear isomer is known, with mass number 253. 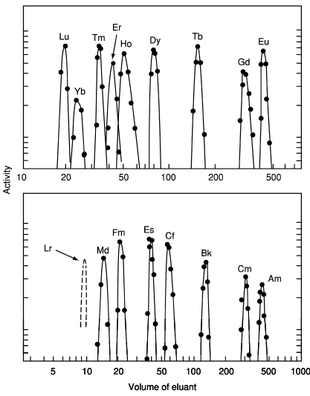 The longest-lived lawrencium isotope, 266Lr, has a half-life of ten hours and is one of the longest lived superheavy isotopes known to date, suggesting that it is perhaps on the shore of the island of stability of superheavy nuclei. However, shorter-lived isotopes are usually used in chemical experiments because 266Lr currently can only be produced as a final decay product of even heavier and harder-to-synthesize elements: it was discovered in 2014 in the decay chain of 294Ts. The isotope 256Lr (half-life 27 seconds) was used in the first chemical studies on lawrencium: currently, the slightly longer lived isotope 260Lr (half-life 2.7 minutes) is usually used for this purpose. After 266Lr, the longest-lived lawrencium isotopes are 262Lr (3.6 h), 261Lr (44 min), 260Lr (2.7 min), 256Lr (27 s), and 255Lr (22 s). All other known lawrencium isotopes have half-lives under 20 seconds, and the shortest-lived of them (252Lr) has a half-life of only 390 milliseconds.However, the undiscovered isotopes with mass numbers 263 to 265 are expected to have longer half-lives (263Lr, 5 h; 264Lr and 265Lr, 10 h). The half-lives of lawrencium isotopes mostly increase smoothly from 252Lr to 266Lr, with a dip from 257Lr to 259Lr. ^ Emsley, John (2011). Nature's Building Blocks: An A-Z Guide to the Elements (New ed.). New York, NY: Oxford University Press. p. 278–9. ISBN 978-0-19-960563-7. ^ a b Penneman, R. A.; Mann, J. B. (1976). "'Calculation chemistry' of the superheavy elements; comparison with elements of the 7th period". Proceedings of the Moscow Symposium on the Chemistry of Transuranium Elements: 257–263. doi:10.1016/B978-0-08-020638-7.50053-1. ^ Brown, Geoffrey (2012). The Inaccessible Earth: An integrated view to its structure and composition. Springer Science & Business Media. p. 88. ISBN 9789401115162. ^ a b c d e Emsley, John (2011). Nature's Building Blocks. ^ a b c Greenwood, Norman N. (1997). "Recent developments concerning the discovery of elements 101–111" (PDF). Pure Appl. Chem. 69 (1): 179–184. doi:10.1351/pac199769010179. ^ Kaldor, Uzi & Wilson, Stephen (2005). Theoretical chemistry and physics of heavy and superheavy element. Springer. p. 57. ISBN 1-4020-1371-X. ^ Eskola, Kari; Eskola, Pirkko; Nurmia, Matti; Albert Ghiorso (1971). "Studies of Lawrencium Isotopes with Mass Numbers 255 Through 260". Phys. Rev. C. 4 (2): 632–642. Bibcode:1971PhRvC...4..632E. doi:10.1103/PhysRevC.4.632. ^ John Emsley (2011). Nature's Building Blocks: An A-Z Guide to the Elements. Oxford University Press. pp. 278–9. ISBN 978-0-19-960563-7. ^ Lide, D. R., ed. (2003). CRC Handbook of Chemistry and Physics (84th ed.). Boca Raton, FL: CRC Press. ^ Hoffman, Darleane C.; Lee, Diana M.; Pershina, Valeria (2006). "Transactinides and the future elements". In Morss; Edelstein, Norman M.; Fuger, Jean (eds.). The Chemistry of the Actinide and Transactinide Elements (3rd ed.). Dordrecht, The Netherlands: Springer Science+Business Media. p. 1686. ISBN 1-4020-3555-1. ^ Balasubramanian, K. (4 December 2001). "Potential energy surfaces of Lawrencium and Nobelium dihydrides (LrH2 and NoH2)". Journal of Chemical Physics. 116 (9): 3568–75. Bibcode:2002JChPh.116.3568B. doi:10.1063/1.1446029. ^ Xu, Wen-Hua; Pyykkö, Pekka (8 June 2016). "Is the chemistry of lawrencium peculiar". Phys. Chem. Chem. Phys. 2016 (18): 17351–5. Bibcode:2016PCCP...1817351X. doi:10.1039/c6cp02706g. Retrieved 24 April 2017. ^ Nugent, L. J.; Vander Sluis, K. L.; Fricke, Burhard; Mann, J. B. (1974). "Electronic configuration in the ground state of atomic lawrencium" (PDF). Phys. Rev. A. 9 (6): 2270–72. Bibcode:1974PhRvA...9.2270N. doi:10.1103/PhysRevA.9.2270. ^ Eliav, E.; Kaldor, U.; Ishikawa, Y. (1995). "Transition energies of ytterbium, lutetium, and lawrencium by the relativistic coupled-cluster method". Phys. Rev. A. 52: 291–296. Bibcode:1995PhRvA..52..291E. doi:10.1103/PhysRevA.52.291. ^ Zou, Yu; Froese Fischer C.; Uiterwaal, C.; Wanner, J.; Kompa, K.-L. (2002). "Resonance Transition Energies and Oscillator Strengths in Lutetium and Lawrencium". Phys. Rev. Lett. 88 (2): 183001. Bibcode:2002PhRvL..88b3001M. doi:10.1103/PhysRevLett.88.023001. PMID 12005680. ^ a b Sato, T. K.; Asai, M.; Borschevsky, A.; Stora, T.; Sato, N.; Kaneya, Y.; Tsukada, K.; Düllman, Ch. E.; Eberhardt, K.; Eliav, E.; Ichikawa, S.; Kaldor, U.; Kratz, J. V.; Miyashita, S.; Nagame, Y.; Ooe, K.; Osa, A.; Renisch, D.; Runke, J.; Schädel, M.; Thörle-Pospiech, P.; Toyoshima, A.; Trautmann, N. (9 April 2015). "Measurement of the first ionization potential of lawrencium, element 103" (PDF). Nature. 520: 209–11. Bibcode:2015Natur.520..209S. doi:10.1038/nature14342. PMID 25855457. ^ Gunther, Matthew (9 April 2015). "Lawrencium experiment could shake up periodic table". RSC Chemistry World. Retrieved 21 September 2015. ^ "WebElements Periodic Table of the Elements". Webelements.com. Retrieved 2010-04-03. ^ Haire, R. G. (11 October 2007). "Insights into the bonding and electronic nature of heavy element materials". Journal of Alloys and Compounds. 444–5: 63–71. doi:10.1016/j.jallcom.2007.01.103. ^ a b Khuyagbaatar, J.; et al. (2014). "48Ca + 249Bk Fusion Reaction Leading to Element Z = 117: Long-Lived α-Decaying 270Db and Discovery of 266Lr" (PDF). Physical Review Letters. 112 (17): 172501. Bibcode:2014PhRvL.112q2501K. doi:10.1103/PhysRevLett.112.172501. PMID 24836239. ^ Clara Moskowitz (May 7, 2014). "Superheavy Element 117 Points to Fabled "Island of Stability" on Periodic Table". Scientific American. Retrieved 2014-05-08. Silva, Robert J. (2011). "Chapter 13. Fermium, Mendelevium, Nobelium, and Lawrencium". In Morss, Lester R.; Edelstein, Norman M.; Fuger, Jean (eds.). The Chemistry of the Actinide and Transactinide Elements. Netherlands: Springer. doi:10.1007/978-94-007-0211-0_13. ISBN 978-94-007-0210-3.